In a saucepan, cook onions, garlic and ginger in 2 tablespoons oil over moderate heat, stirring, 3 minutes, or until onions are slightly softened. Transfer to a bowl with water, soy sauce, sherry, sugar, salt, white pepper and red pepper flakes. 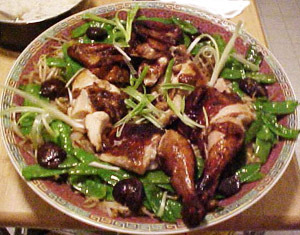 Add snow peas to bowl and toss gently to coat. 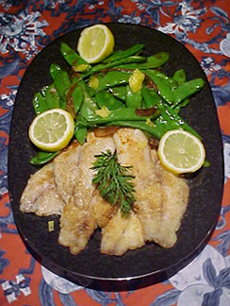 Season tilapia with salt and pepper to taste and dredge in cornstarch, shaking off excess. 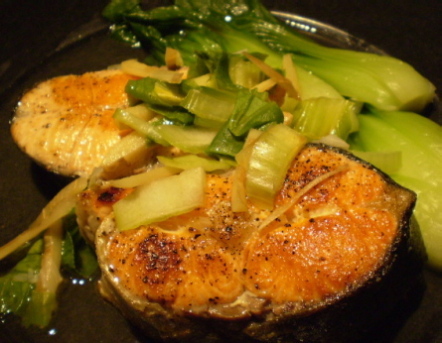 In a large stainless-steel or enameled skillet saute fish in remaining oil, adding more as necessary, over moderately high heat 1 1/2 minutes on each side, or until lightly browned. Add snow pea mixture and cook 1 minute, adding more water if needed to thin sauce. Cook until snow peas are just tender. 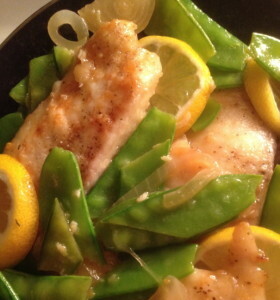 Transfer tilapia to a platter and pour sauce and snow peas around it. Garnish with lemon wedges, if desired.